Vacuum Assisted Venous Drainage is relied upon to encourage return blood flow through the venous catheter. The Boehringer VAVD Controller was designed specifically to ensure this practice is both safe and efficient. Precision adjustment and redundant safety features make this the equipment of choice for top heart programs across the country. The newest feature of the VAVD Controller, VacPac™ is a simple, single patient, sterile disposable that assures all of the safeties built into your Boehringer VAVD controller stay in your circuits. Buying your product brings an assurance that when our department puts it to the test and it passes, then it's a product worth having. 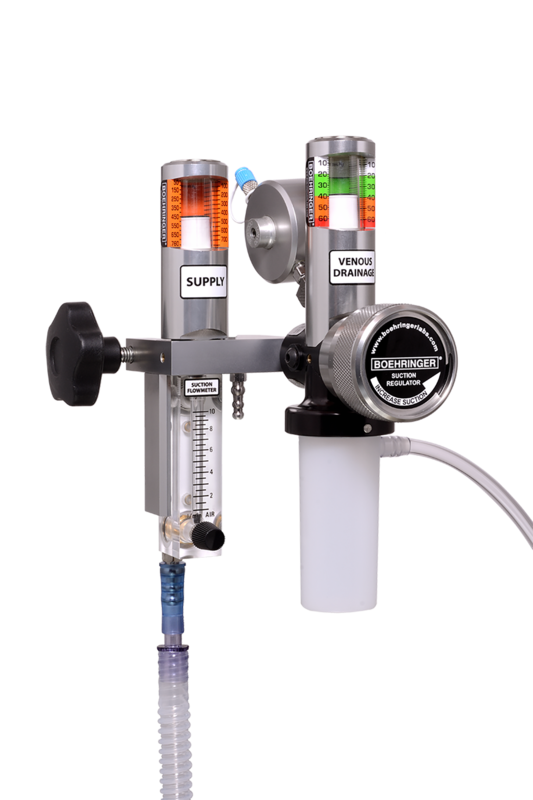 The VAVD Controller reacts to circuit demands and input conditions to maintain a reliable and consistent output of suction applied to your cardiotomy reservoir. Waste Anesthetic Gas from the membrane oxygenator is a dangerous background contaminant and occupational health experts agree these gases should be removed from the perfusionist's work space. Allows for permanent connection of a Luer-type pressure transducer to allow the VAVD suction pressures to be recorded electronically. A precision machined redundant system vents excess NEGATIVE and POSITIVE pressures in the event of any malfunction in the main regulator or accompanying pump circuit. Open caps on the cardiotomy reservoir or kinked supply tubing can be readily identified and addressed by noting a drop in the supply pressure gauge. The only device on the market built to an appropriate clinical range. In the unlikely event blood does enter the control, patented design and control surfaces ensure continued regulated output.